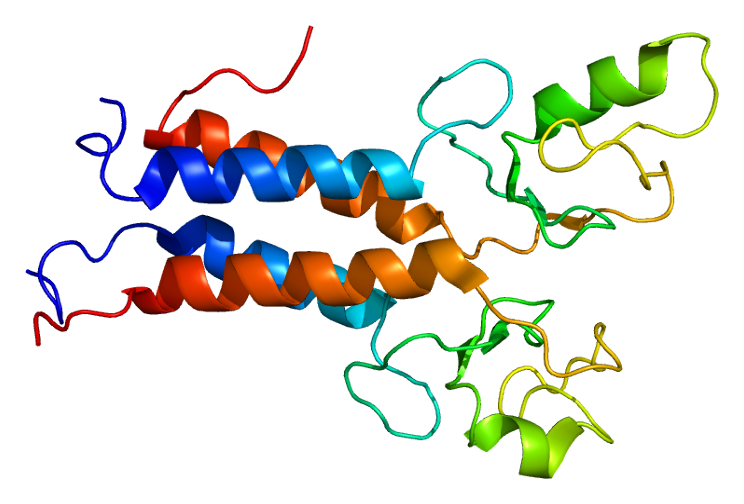 Protein produced by the BRCA1 gene. Source: Emw (Wikipedia). At issue was the patent held by Myriad Genetics on the BRCA1 and BRCA2 genes, mutations in which are known to cause breast and/or ovarian cancer in most people who have them–a condition recently publicized by Angelina Jolie’s decision to have a preventive double mastectomy after learning she had such a mutation. Myriad’s patent was specifically on the genes as isolated from the human genome (since the “natural state” cannot be patented). Because of the patent, no one could produce the isolated genes without Myriad’s permission, which meant no one could test for them without Myriad’s permission. Myriad charges nearly $4,000 for a complete test, placing it out of reach for many women without insurance. Even more worrying was that the prohibition on isolating the genes made it virtually impossible for medical scientists to conduct independent research on them, such as peer reviewing Myriad’s results, creating more reliable tests, and even devising better cancer treatments. The Association of Molecular Pathology, along with researchers at several major universities, sued Myriad Genetics to invalidate the patents and open up new lines of research. After some conflicting decisions in the lower courts, the Supreme Court ruled today what most geneticists said was common sense–that the isolated gene is identical to the gene in the body and therefore is not eligible for patenting. The arguments before the Court were thick with analogies. Can you patent pure gold refined from gold ore? Can you patent a baseball bat “isolated” whole from a piece of wood? These cases are obvious, but genes lie somewhere in the middle. Indeed, the Court ruled that synthetic or engineered DNA could still be patented, including a certain type of copy called cDNA.Myriad had argued that revoking patents on human genes could itself stifle innovation by removing economic incentives, but by retaining the cDNA patents, they retain control of some testing and copying techniques. Meanwhile, the loss of the patents on the natural genes opens up new avenues of research that people have been specifically waiting to get started.With the number of 5-4 rulings they turn out, the Supreme Court has something for everyone to hate, so it’s all the more refreshing to see them put up a unanimous show of common sense today. This entry was posted in Biology, Current events, Medicine and tagged AMP v. Myriad, BRCA, brca1 and brca2 genes, genetics, human gene patents, myriad genetics, supreme court. Bookmark the permalink.